My love for the work - and work ethic - of Alain Resnais took hold even before I'd seen his films. Like many other films - Magnolia, L'Avventura, Persona, among others - Last Year at Marienbad was one I had a distinct vision of in my head long before I'd seen it (I'll have to write about my experience with Magnolia sometime, come to think of it). That vision was no matter of expectations, for what could one really expect from any description of Marienbad? Rather, it's the way the film's few familiar images repeat through your head, the way you imagine them intersecting and interacting, the intangible qualities governed by performance and shot length and music and all that. 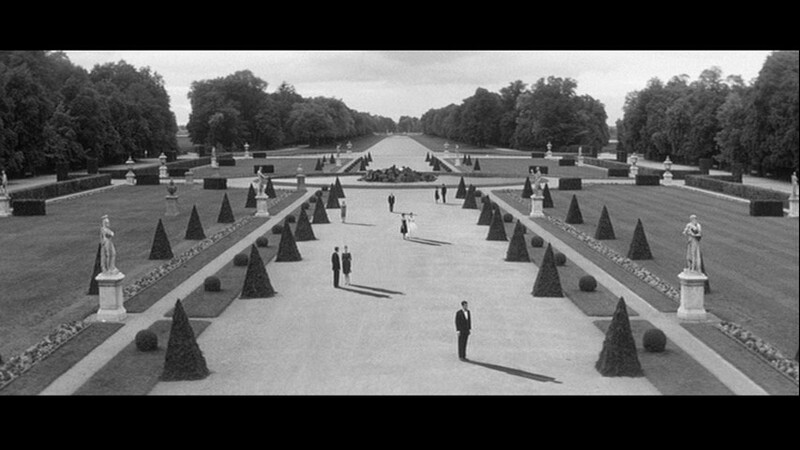 This is, of course, Marienbad's lasting contribution to the pop culture consciousness (and honestly, the fact that only the people produce shadows is the least compelling aspect of it), but the film is filled with imagery as mysterious and potent as any in the history of the medium. That Marienbad was almost exactly the film I'd imagined (and so much more) is a testament to both the elasticity of my vision for it, and the even more slippery nature of the film itself. 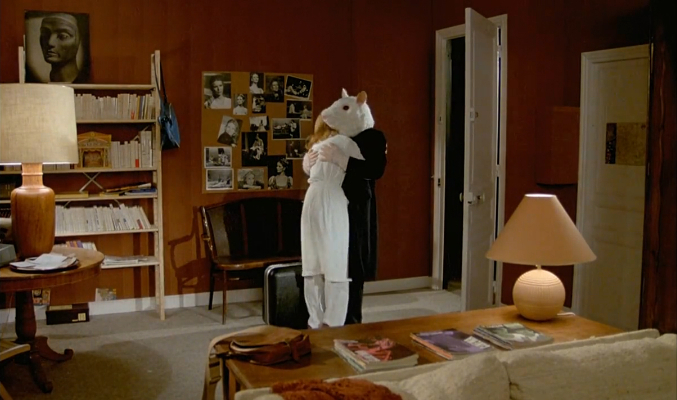 Nevertheless, Resnais took on in my head the sort of rarified quality one cannot associate with many others. For one, as an auteur, he's very difficult to nail down. It's easy to say he's a more aesthetically-driven director than a thematic one, but as refined and captivating as his mise-en-scene is, I think that sells him more than a little short. Mon oncle d'Amerique is as slippery a film as any other, refusing to come to any distinct conclusion while eliciting thousands. The film's entire first half-hour is composed entirely of interviews with its three main characters - René (Gérard Depardieu), a businessman on the eve of a new opportunity; Janine (Nicole Garcia), an activist who becomes a stage sensation almost by chance; and Jean (Roger Pierre), an intellectual and politician who quickly begins an affair with Janine. Once it settles into what one might term a "normal" rhythm for a film, it hardly ends its investigation. The film is not a direct adaptation of a novel, but it is based on the writings of Henri Laborit, a French physician and philosopher, who also appears in the film. His input elucidates many of the characters' motivations and beliefs by finding their roots in biology and lab tests, which I know sounds painfully droll, but actually figures into a modern movement of intertwining the inexplicable with the provable that I find endlessly fascinating (see also: Nostalgia for the Light). Resnais chiefly uses fight-or-flight studies involving rats, and interconnects them in some ways so delightfully characteristic of him. I mean, that's not normal. But it's this slightly detached view, bemused vision of humanity that I find so invigorating about Resnais' work. As much as Stanley Kubrick gets knocked for taking a God's-eye-perspective of his stories and characters, Resnais almost does him one better. Resnais isn't only interested in how we meagerly fit into the world order, but also in how the present meagerly fits into the timeline of our lives. 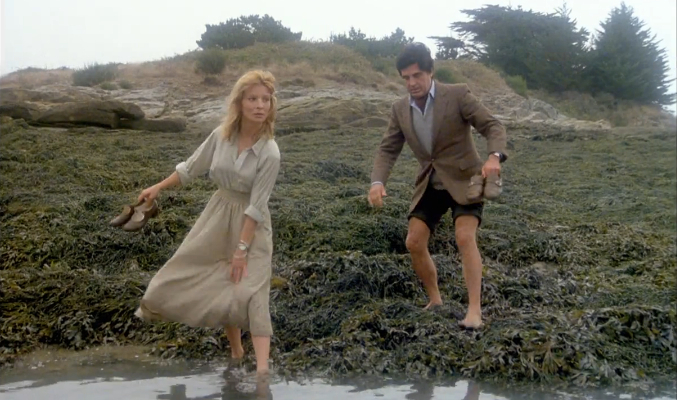 In Mon oncle d'Amerique, we might be following a couple on an island, but we're also in the man's childhood, and we're also being debriefed on scientific experiments. Resnais explored this sort of flattened chronology in 1968's Je t'aime, Je t'aime, about a man selected for a time travel experiment, who starts to relive moments from his life in seemingly random order. Much more so than his considerable accomplishments with composition and camera movement, Resnais' most defining trait is his editing. Although he hasn't taking an editorial credit since his short film years in the 40s and 50s, his touch in that department is unmistakeable. He knows exactly how to set up certain recurrent images, and when to precisely drop them back into his God's-eye-view timeline. Resnais has stated that he had an early feeling that "there was something important in cinema, which was the manipulation of time through editing," which has carried him through his entire career. It's not a simple matter of condensing or elongating the narrative, but in how time itself is a construct. His editorial acumen and omniscient perspective doesn't end merely with time. By interconnecting the past and present, then mixing them together with philosophy, nature, and anything else that suits him (the last sequence here is pretty wonderful), he puts everything on an equal plain. One might say, then, that Resnais doesn't have much love for his characters, an often-cited necessity in filmmaking, but I don't really see how that became such a defining element to creating viable art. There are all kinds of emotions to be stirred, observations to be made, and ideas to be expressed that have nothing to do with how much anyone (the artist or the audience) "relates" to the piece's subjects. Resnais' films are as great an example of that as, say, Picasso's paintings. Even when he finds relatable material, as when René is pitted against a coworker for his own job following a merger, he doesn't take long to draw direct comparisons between his plight and that of a lab rat; both answer to the sound of a bell. But that's just the lighter observation, a more amusing tangent. Resnais' real objecting is much more spiritual, direct, and resonant. He truly invests his characters with depth of feeling, pausing to observe René as he separates from his wife, perhaps forever, to further his career hundreds of miles from his home. Their embrace is not an amusing curiosity, but it's hardly embellished either - it's just filled with sorrow. But as genuinely moving as his human drama often is, it's just as wrenching to see a man struggle with his marriage, or health problems, or career stalling as it is to see a rat trapped in an electrified compartment, or a turtle grappling with having its world turned literally upside down. It's a bold bet, but it's one worth making. His point is not that human suffering is immaterial, but that it is inherent to the biological order of the world. Mon oncle d'Amerique is available in HD on Hulu Plus through The Criterion Collection. To try Hulu Plus and get two weeks free, click here.